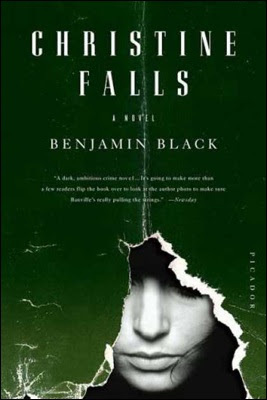 Just pages into Benjamin Black's Christine Falls, it becomes very noticeable that a writer is involved. It opens efficiently with a crime and the murky atmosphere of a drunken evening, in which we meet the main character, Quirke, and one of his main antagonists, his brother. Booze, brothers, betrayal: in this respect, it's little different than a dozen other noir novels you might have read. Yet the shadows seem murkier; a lamp's amber oval spilling over a desk seems more lonely and more nakedly revealing, and Quirke seems instantly more real. Far from just being a part of process, of the establishing shot, it's clear that a light is on, and someone is at home. There's an artist working here. That artist is actually Booker Prize-winner John Banville, writing under a pseudonym — a fact that, when I discovered it, had an effect like watching an overturned table, spilled egg and a puddle of orange juice speckled with an archipelago of shattered glass suddenly coalesce and vomit upward until it rearranged itself into This Nutritious Breakfast. For a few minutes, before thinking to flip through the front and back of the book for a biographical blurb, I felt like I'd secretly discovered the greatest detective fiction writer alive. The rest of the world somehow hadn't noticed. Sure, reviewers had gushed on both covers, but this was something everybody would know, right? The second interesting result of this "cheap fiction" is that it seems to solve the problems of his serious fiction. Years back, I picked up The Sea — the book which finally won him the Booker Prize — and I found it beautifully ponderous but ponderous nevertheless. I instantly had that reaction that many serious readers seem to have to modern novels that win prestigious awards: "Yeah. 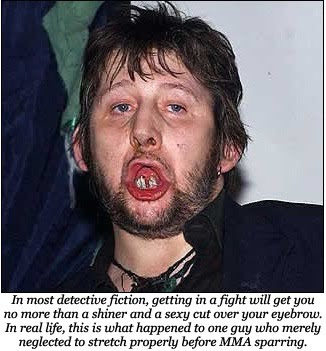 This is definitely a book that would win the Booker Prize." Its prose was rich, sharply written, observant and ostensibly not really about anything, save perhaps an observance of itself. The book offers disjointed conversations about a few things that eventually reveal a single conversation about one thing. The process of discovering that one thing includes a captivating voice confronting and eluding itself, but, once the narrative is reordered chronologically, it's still about relatively little. You can imagine, then, what a happy marriage Christine Falls presents between a genre that demands beats, beatings, deaths and more hysterical displays from the human animal, and a writer whose talent lies in creating layered and dense atmosphere and memorable characters knocking about their own heads uncomfortably. Far from being "cheap fiction," Christine Falls likely solves problems of accessibility for Banville's fiction, spurring it to accept a more intense degree of story while still meeting the writer's terms for character and observation. Unfortunately, to share any more than a little of the plot ruins it, but Banville's strength in characterization makes his protagonist so gruffly charming that meeting him is almost enough. Quirke is the pathologist at Dublin's Holy Family Hospital in the 1950s. As a widower, he has only an ex-life: ex-happiness and ex-companionship, but he has moved on to ex-fall-down-drunk and into the sort of roguishly distant and semi-drunk that works so well in noir fiction or on young girls in college. At the beginning of the book, he discovers his brother, Mal, forging the case file of a woman named Christine Falls, who died in their hospital. It's her death that leads Quirke to suspect his brother, search for a possibly kidnaped baby and for its sire, who had clearly used some influence to remove Falls from prying eyes in life and death. Quirke chose an expensive claret and made an ostentatious show of swirling a splash of it in his glass, sniffing, and frowning in approval to the wine waiter, while Mal looked away, controlling his impatience. He would not take even a glass of the wine, saying he had work to do in the afternoon. "Fine," Quirke snapped. "All the more for me, then." The elderly waiter in his shiny black tailcoat tended them with the unctuous solemnity of an usher at a funeral service. After Quirke had ordered salmon in aspic and a roasted grouse, Mal asked for chicken soup and a plain omelette. "For God's sake, Mal," Quirke said under his breath. Passages like this above exemplify the real pleasure to be had in reading Christine Falls. All great noir heroes are masters of the one-liner, the gut-punch description that destroys another character and elevates the wiseguy narrator in our esteem. But those wiseguys often fire indiscriminate shots: they pigeonhole everyone, and they flatten other characters to pressboard dimensions. The fun of Banville's writing is that he still writes the delicious zinger but does it within the confines of only a few characters intimately related to Quirke. It gives both Quirke and them a depth that someone like Philip Kerr's Bernie Gunther will never have. When Quirke describes a drunk friend whose jokes are now all secondhand, he realizes, "He's Falstaff grown inconvenient," then reminds himself that knowing Falstaff does not make himself Prince Hal. There are other intelligent elements to the book, but discussing them with any seriousness runs the risk of revealing too much of them. The book meditates on the looming, parasitic role of the Roman Catholic Church in Irish life, as well as the lives of Irish Catholic immigrants in the Boston area. Naturally, it also discusses the role of immigration in Irish and Irish-American society, as well as the desired disposability of unmarried pregnant women and the role of lying-in hospitals and orphanages. Some of these themes are familiar, and to be sure they aren't fully explored. But they're a far more intelligent and compelling backdrop than is common in most noir, sensibly matching narration and a main character of almost lush dimensions. Banville's book is not perfect. Were one to think of it purely as literature and outside the scope of the genre it's playing around in, some moments would feel too melodramatic, too momentous for real life. And while it has things to say about topics like the church and its treatment of single mothers, I'm not sure that it says as much as it should. Then again, serious literature is perfectly content to cite these things and wrestle with them irresolutely and even flippantly, and critics are perfectly content to cite that indeterminate psychological walkabout as evidence of a moral breadth of feeling. Perhaps the delight in a novel like Christine Falls is that it wanders about these topics as much as an inward-focused first-person narrative but at least has the decency to give the audience the sense that it's doing so while accomplishing something. That merging of the terms of two types of fiction style has at least one concrete appeal: when goons stomp the hell out of someone in Banville's noir world, that someone actually gets significantly injured. Even if you wouldn't consider the rest of the book literature — and you would be mistaken — just that one detail shows a maturity and knowledge of middle-school biology impossibly complex for most detective fiction. Violence has consequences: broken people aren't just a device for theatrically speaking in epigrams. Often, broken people simply stay that way.